The labelling of poultry can be confusing, not just because there may be many different labels all saying similar things, but because the average consumer has no idea what any of the terms actually mean. When buying poultry, and in particular chicken, it can be difficult to decipher the various food labels to know how your purchase has been raised and treated during its lifetime. The first thing to be aware of is what it means if your poultry doesn’t bear a label describing its method of raising, feeding and production. This is what is called conventionally raised breeding by the meat trade, although many people would call it ‘intensive’ farming. Conventional or intensive breeding means the animals have been fed conventional food, which may, outside the EU, contain genetically modified organisms as well as pesticides, herbicides, fungicides and fertilisers, all of which are on or in the grain that is used in food production. Conventionally raised poultry may also be given antibiotics which remain in the flesh. Conventional or intensive farming also restricts the animals, giving them little opportunity to move around, so that all the calories they consume are used to make more meat (and fat) rather than being used up as energy to allow the animal to roam freely. The most intensive form of poultry raising is called battery farming and involves the animals being kept in small cages and sometimes having their beaks cut short to stop them pecking each other. Certified organic poultry requires two things of the farmer – he has to feed his animals certified organic foodstuffs, some of which he is supposed to produce himself and he should not medicate his livestock. Many people prefer to eat organic poultry and eggs because it gives them confidence that their food does not contain the remains of antibiotics and steroids that are often used to treat conventional chickens. However, while the food it eats must be organic, that doesn’t mean it will be the normal food of a poultry bird – chickens would traditionally eat a lot of grain, some grass and insects. What organic birds get fed, for much of the year, may simply be organic concentrate which is a granular food that contains proteins and carbohydrates but may not be a fresh food, nor one that contains much in the way of vitamins. Organic poultry has to be raised in open-range conditions such as a barn and not kept in cages – in addition the chickens must have access to open air runs when weather conditions allow and – where possible – should have this access for at least one third of their life and they must be raised on organic land. If they are not allowed outside access, they must be fed sprouted grain during the period that outside access would otherwise be given. When poultry is free-range, it has to be kept in a barn, and must have access to the outdoors on a continuous daytime basis. There is a maximum density allowed of 2,500 birds per hectare – and if you stop to think about it, that’s not a lot of space for each individual chicken, which means that weaker or more nervous birds may never actually get outside, as they may be prevented from exiting the barn by stronger and more aggressive neighbours. Free range guidelines also require that the birds be inspected daily but not that they be inspected individually. This means that somebody must visit each barn every day, whereas intensively farmed birds may only be visited twice a week to check food and water supplies. The Soil Association’s Organic label requires that birds are both raised on organic principles and allowed to walk about outdoors and be able to dust bathe which is a chicken behaviour that requires an area of bare earth on which they can sit and scratch dust up into their feathers – this behaviour is prevented in many other free range schemes because it damages the soil. 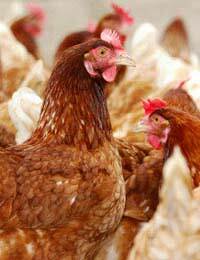 Soil Association Organic poultry is therefore that which is raised closest to the birds’ natural behaviour and inclinations and is likely to have both the healthiest animals and those which have enjoyed the best quality of life. Why is British Veal a More Ethical Choice?